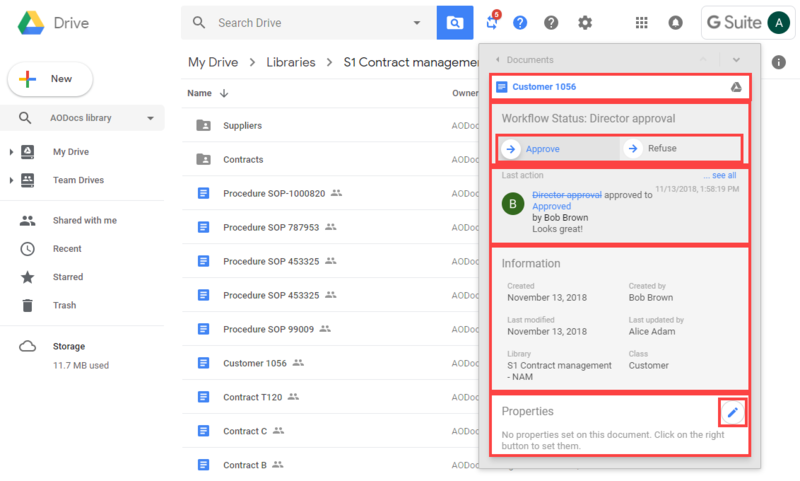 With the AODocs Smartbar installed, you can perform workflow actions in your Team Folders and Secured Folders when working in Google Drive. Important: Your library administrator must have a workflow configured in the library. 1. In Google Drive, open a Team Folder or Secured Folder. The workflow button is displayed if you have workflow actions to perform. The number highlighted in red indicates how many documents are waiting for your validation. 2. Press the workflow button. A pop-up shows all documents in need of validation sorted by workflow state. Tip: Press All to display all the documents you can validate. You can also display documents for specific workflow states. 3. Select the title of a document to display the document information card. Note: There are more ways you can edit document properties when working on Google Drive. Learn more: Display and edit file properties from Google Drive. Tip: You can use the up and down arrows to move to the previous or next document in the list. 4. Press the name of the required workflow action. 5. If required, enter a comment before submitting the workflow action. Note: Library administrators can force you to enter a comment before submitting the workflow action. If a comment is required you will not be able to complete the workflow action without one, the submit button will stay grayed out. Tip: Press Document to return to the document card. The pictures on the support.aodocs.com articles are very tiny and hard to see. One picture per step with a high resolution would be preferable to be able to see details.